Handling Tips: 36° F. Keep cold and dry. Protect from light. General Information: Both varieties can be enjoyed raw or cooked. The white endive is usually larger and lends itself for better cooking. Decorate salads, fill individual leaves with dip, cheese and or caviar and create magical hors d'oeuvres. 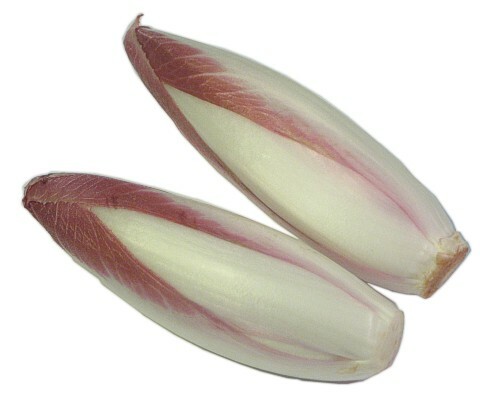 Endive is great in its own soup, halved and grilled, or baked au gratin with black forest ham. Contains vitamins A, C and potassium. Nutritional: Endive is rich in many vitamins and minerals, especially in folate and vitamin A and K, and is high in fiber. Applications: The smooth, creamy white leaves may be served stuffed, baked, boiled, cut and cooked in a milk sauce, or simply cut raw. Slightly bitter, the whiter the leaf, the less bitter the taste. The harder inner part of the stem, at the bottom of the head, should be cut out before cooking to prevent bitterness. History: The technique for growing blanched endives was accidentally discovered in the 1830s in the Josaphat valley in Schaerbeek, Belgium. Endive is cultivated for culinary use by cutting the leaves from the growing plant, then keeping the living stem and root in a dark place. A new bud develops but without sunlight it is white and lacks the bitterness of the un-blanched foliage. Today France is the largest producer of endives.